Preschool years (ages 2-5) are the crucial years that lay a foundation to a life-long journey of learning, hence aptly called as the Early Years Foundation Stage. 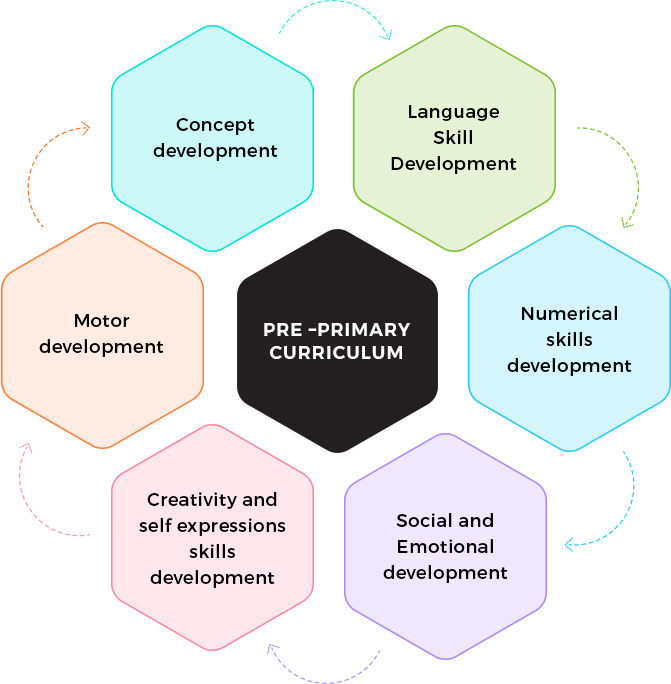 The curriculum focuses on play-way method with the epicenter being the key areas of learning: physical, personal, social and emotional development; literacy skills; numeracy skills; understanding the world through enquiry; and expressions through art, music and dance. The curriculum provides a balance of daily teacher-directed activities and child-directed activities that make learning fun. Connecting knowledge to life outside the school. Ensuring that learning shifts away from rote methods. Enriching the curriculum so it goes beyond text books. Making examinations more flexible and integrating them with classroom life. Opportunities in Dance, Fine Arts, Theatre, Western and Indian Music, Speech and Drama and Yoga, which facilitate a well-rounded development. These are part of the regular curriculum, and are also being offered as co-curricular and core activity programmes. Celebration of the changing rhythms of the year through a variety of festivals and activities. These are celebrated through whole-school assemblies, play performances, special holidays and functions, which help children in meaningful bonding and appreciation of such festivals. We at CIS follow Uniform Pattern of Assessment. The first Term consist of one Periodic Assessment and one Term Assessment. The second term also consist of one Periodic Assessment and one Final Assessment.